According to the BBC the Royal Family will visit Islay when setting off for a holiday cruise around the Western Isles. 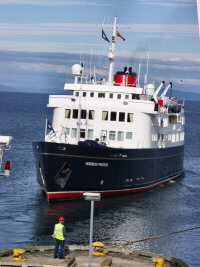 They will be travelling on the Hebridean Princess, a ship I've seen several times on Islay and Colonsay. The picture of the right shows the Hebridean Princess leaving Scalasaig on Colonsay in July 2003, my mother and me had been on a visit to Colonsay and Oronsay when we saw her. The report doesn't say how long they will stay on Islay apart from arriving and boarding the ship. Either way, it's not their first visit to Islay: Laphroaig has a Royal Warrant and Prince Charles has visited the distillery at least once in 1994. He will have mixed memories of the visit, as he crashed the plane when landing on Islay as the then Laphroaig distillery manager Ian Henderson recalls.